Maryam Faghihimani is the founder and president of the Centre for Cultural Diplomacy and Development. After leaving her home country Iran in 2003, Faghih imani has lived, studied and worked in number of countries such as Malaysia, Portugal, Finland, Germany and Norway. Her educational filed and research interests focus on sustainable development, cultural diplomacy and capacity building. Previously, she worked as sustainability adviser and head of the Green UiO at the University of Oslo. 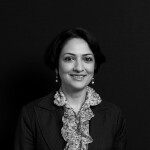 Additionally she has been core group member, adviser and board member for number of research projects, organizations and networks including, the European Science Foundation, Network of Universities in the Capitals of Europe, Nordic Sustainable Campus Network, the Erasmus Mundus Middle East Chapter, the World Education Foundation and Professional Women Network (PWN Norway). Faghigimani was born and raised in Iran as a daughter of one of the prominent ayatollahs in her hometown. After being repeatedly denied rights to higher education and work because of her gender and secular-liberal thoughts, in 2003 she left Iran. In spite of her father’s demands, Faghihimani has pursued an academic career in Asia and Europe focused on cultural diplomacy, sustainable development, human rights and in particular women’s rights with an emphasize on foresight approach.